After a global tour, The Power of Penn Campaign returns to Philadelphia on April 2 with an event at the Metropolitan Opera House. 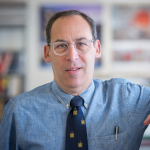 The architect behind the restoration of the Met Philly is Sam Olshin, Principal at the firm of Atkin Olshin Schade Architects. Olshin discusses how he stays connected with Penn and the challenges of resurrecting a historic venue. Tell me a bit about what Penn has meant to you throughout your life. I always knew that I wanted to apply to Penn. Both of my parents went here for undergraduate and graduate school. I knew Penn well, even as a child. I used to bike around this neighborhood a lot, and I still have a sports jacket that my father bought from a clothing store that used to be on campus called Eddie Jacobs. I started here as a pre-med for one semester before I got more heavily into the Design of Environment (DOE) program, where I learned from great professors like Frank Kawasaki and David Brownlee. I lived in the Quad freshman year, and I later lived in the High Rises—in the same location where my mom’s sorority had been. To this day, I’m still close with many fellow students and professors that I met in graduate school. The Penn experience has been, in a word, phenomenal. You’ve been a member of the Weitzman School of Design Alumni Board and a longtime, consistent supporter of annual giving. What influences you to continue supporting and giving back to the School? I believe in design as a transformative process. As a city dweller, I know how much of an impact urban design can have on people’s lives. When I was at Penn’s Graduate School of Fine Arts, I was involved in a program called Architecture in the Schools, where we volunteered in the Philadelphia public school system and got really involved with kids from disadvantaged neighborhoods. That kind of outreach showed me that Penn believed in the city and was dedicated to making lives better across different communities. That commitment has only gotten stronger over time. From your perspective as an alumnus and volunteer, what do you think of the evolution of the Weitzman School of Design and the University as a whole? I think it’s incredibly positive. I’ve been on a couple of architectural juries at Penn, and I’ve been back for symposia and lectures. Penn’s architecture students are coming up with bold and visionary work at a young age. Penn has evolved to the point where all these disciplines are really talking to one another. It was more siloed when I was a student. Today, architecture practice is a mix of landscape, preservation, and city planning. Our firm’s work is one part of a larger experience, and Penn has done a great job to instill that. No architect should be alone in their endeavor. Your firm has worked on other campus projects, too, right? Yes! Our firm has been very fortunate to have the chance to work on a few different Penn buildings—including College Hall, the Richards Medical Building, the Jaffe History of Art Building, the Mainwaring Wing at the Penn Museum, and Stiteler Hall. Penn’s campus has grown tremendously, and the University has shown a real commitment to preserving all the buildings here while also creating newer opportunities for evolved teaching. Let’s talk about your work on the Metropolitan Opera House. What state was the building in when you first started working? What was a challenge you faced when restoring this historic venue? One major issue was the restoration of plaster detailing after so much water damage. We couldn’t preserve it like we wanted, but we did laser scanning of the decorative plaster detailing, and we were able to recreate the look. When you go in now, you see a complete recreation of all the historic plaster that was there. We used new technology to copy it, then old-world craftsmanship to do the elaborate work and join the plaster together. How does it make you feel that The Power of Penn Campaign event will be held in a building that you helped restore? I’m very pleased to be able to renovate a building that will allow Penn to celebrate everything that’s come before and the exciting things on the horizon. Penn doesn’t just have its own wonderful buildings to celebrate in, like Irvine Auditorium, but other venues around the city to celebrate as well. It drives home the kind of connection Penn has with Philadelphia, and I think that’s fantastic.